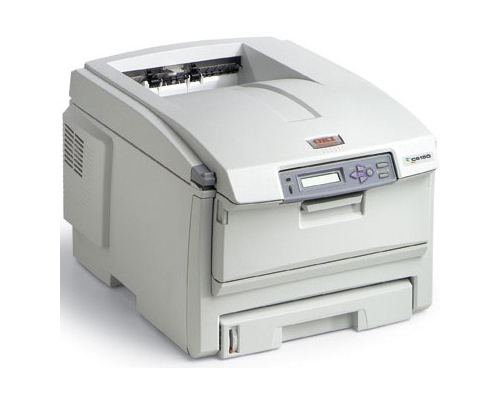 With a 40 GB hard drive standard on some versions of the model, the OkiData C6150 is an excellent color laser printing choice for the office that requires a unit that can also double as a document server. With great print speeds and an excellent warranty plan, this color laser device would make a great addition to the small office in need of brilliant color. Powered by an incredibly fast built in 500 MHz processor, the OkiData C6150 is designed to handle a variety of stressful color print demands. Printing at speeds of up to 26 pages per minute in brilliant color and 32 pages per minute in black and white, businesses will no longer have to wait for sluggish, detailed color printing tasks, and large monochrome document workloads will move along quickly and smoothly. 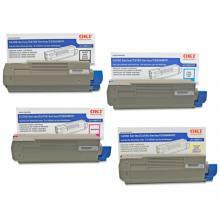 Buyers have a series of options when purchasing a printer in the OkiData C6150 series. Four printers, including the OkiData C6150n, OkiData C6150dn, OkiData C6150dtn, and OkiData C6150hdn offer buyers various options when it comes to luxury hardware items, such as the optional duplex unit. Other options include an additional paper tray and 40 GB hard drive that can be used to permanently store frequently used data, such as whole documents or company logos, internally within the device’s memory. All devices in the series come with standard networking, and there is no non networked model available. Both PCL 6 and PostScript 3 emulations are supported by this unit, while a fairly decent font library is included with the printer as well to help keep document processing moving along smoothly. Single pass color printing allows for a pretty large range of supported paper thicknesses, including card stock and cover stock all the way up to 80 lbs. For a color printer, the maximum print resolution is a little low. With 1200 x 600 dots per inch resolution, charts and graphs should come out looking fine, but color photographic images will be inaccurate to some degree, especially when compared to other laser units on the market that can double this quality. Interestingly, the OkiData C6150 does still specifically support photo paper including the standard 4 in. x 6 in. and 5 in. x 7 in. sizes, but even with glossy paper, actual photographs will not look their best when coming from this printer. 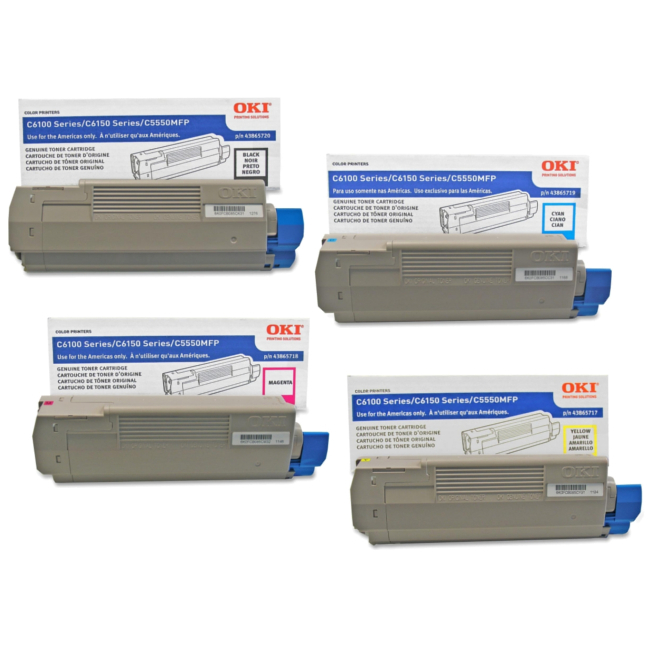 Review it: "OkiData C6150 "
Unlike many color laser printers which require all four color toner cartridges to share a single drum unit, the OkiData C6150 utilizes four individual drums; one for each toner cartridge. 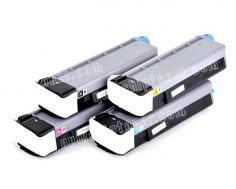 The unit’s black toner cartridge offers users an 8,000 page yield at 5% coverage, while cyan, magenta, and yellow cartridges hold up to 6,000 sheets. Each individual drum unit, whether black or color, offers a 20,000 page yield, though the black drum is slightly less expensive. Up front, buyers will find themselves spending a lot more money on a full restock of drum and toner units, but with this individual setup there is virtually no waste, making this OkiData setup is more costly, but also more efficient.